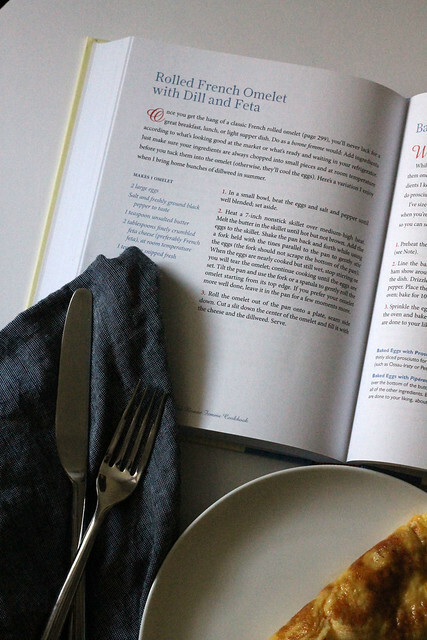 if you follow me on instagram, you saw that this weekend i spent some time learning how to cook a french breakfast thanks to the bonne femme cookbook. if you've been around here long enough, you know that i'm not much of a cook. i leave most of that to craig, while i tackle baking. but i've been trying to cook more, so when the fine folks at harvard common press offered to send this lovely book over, i couldn't pass it up. and so began my omelette extravaganza. i'm not good at omelettes. never have been. i just couldn't understand it. thankfully, the bonne femme helped me out and voila! an omelette! 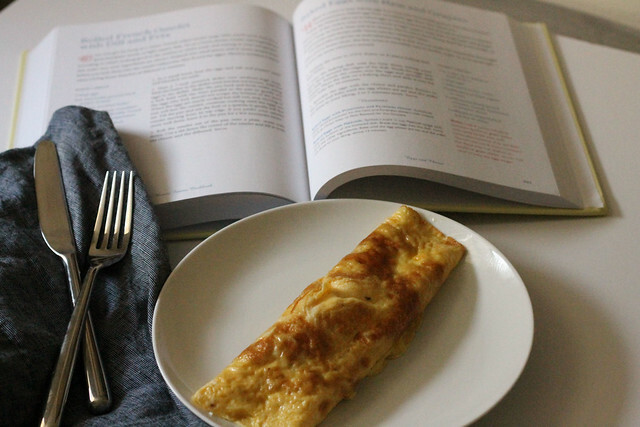 i present you with the secrets to a perfect rolled french omelet with feta and dill (from the bonne femme cookbook)! 1) in a small bowl, beat the eggs and salt and pepper until well blended; set aside. 2) heat a 7-inch nonstick skillet over medium-high heat. melt the butter in the skillet until hot, but not brown. add the eggs to the skillet. shake the pan back and forth while using a fork held with the tines parallel to the pan to gently stir the eggs (the fork should not scrape the bottom of the pan). when the eggs are nearly cooked but still wet, stop stirring or you will tear the omelet; continue cooking until the eggs are set. tilt the pan and use the fork or a spatula to gently roll the omelet starting from its top edge. 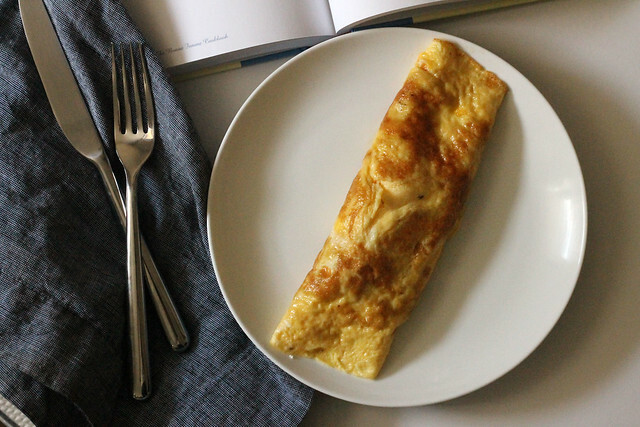 if you prefer your omelet more well-done, leave it in the pan for a few moments more. 3) roll the omelet out of the pan onto a plate, seam side down. cut a slit down the center of the omelet and fill it with the cheese and dill. serve! once you get the hang of it, it's really quite easy. perfect for a slow sunday morning. and because i love you all so much, i'd love to share a copy of the bonne femme cookbook with you! just leave a comment with your favorite breakfast food and your email! i'll choose a winner on friday, november 21!